That trick just won’t work on anyone older than the age of five. If you’ve got eyes, which, apparently first graders do, you can tell when an animal is not the same animal it was yesterday. Using that logic, I can confirm the reports that the groundhog they use to predict the weather in Punxsutawney, Pennsylvania is the same groundhog they’ve been using for over 200 years. He’s kept alive by a secret “groundhog juice” that’s so potent, one sip grants him seven more years on earth. How do we know this for sure? Punxsutawney Phil doesn’t just check for his shadow and report the verdict himself. He speaks to his handlers, a group known non-creepily as the Inner Circle, in Groundhogese. It’s a language only he speaks, not all groundhogs (#notallgroundhogs), so, if they were trading him out every few years, I think we’d notice a little language barrier. To answer fellow Sistorian Corinne’s question that emerged during the editing of this piece: this is all completely and totally true. Or, rather, it is something the Inner Circle completely and totally believes to be true. Honestly, though, the whole magic groundhog thing is barely a patina of weirdness on top of the massive pile of weirdness that is Groundhog Day to begin with. Feel free to sing along, if you’re really feeling your German holidays. When the Germans adopted this tradition, they measured “fair and bright” vs. “clouds and rain” in length of shadow given off by the candles. It’s a natural transition from candles to hedgehogs, and once they arrived in Pennsylvania, to groundhogs. Pennsylvania is literally crawling with groundhogs, guys. It’s like epidemic levels. Please help. Across the state, other communities host their own groundhog day events, in which local rodents predict global weather patterns for the next six weeks. But Groundhog.com, which is also the Punxsutawney Chamber of Commerce website (!! ), claims that the others are imposters. There is one true weather-predicting groundhog, and he goes by the name Phil. Phil eats Nature Valley bars like the rest of us plebians. Stars: they’re just like you! If you can’t show up the one day that you’re actually needed, are you really a magical metorologist? I don’t think so. Of course, Punxsutawney cemented it’s status as the preeminent Groundhog Day location with the 1993 Bill Murray movie, Groundhog Day. The year after that movie was released, 30,000 people descended on the town of 5,000 residents to watch Punxy Phil predict the weather. Since then, it’s become something of a party, with caravans of cars and RVs coming from across the state to attend the early morning event. They named a Little Mr. and Ms. Groundhog, which, disappointingly, were children — not baby groundhogs. They had a sad little street fair with some A+ driftwood sculptures. And they let us meet Phil himself. If you want showmanship, go on February 2nd. If you want that personal, one-on-one time with the master himself, head up there early. His Inner Circle basically left us alone with the cage — though, to be fair, we mostly took selfies with him and probably didn’t look like we could lift 30 pounds of rodent. 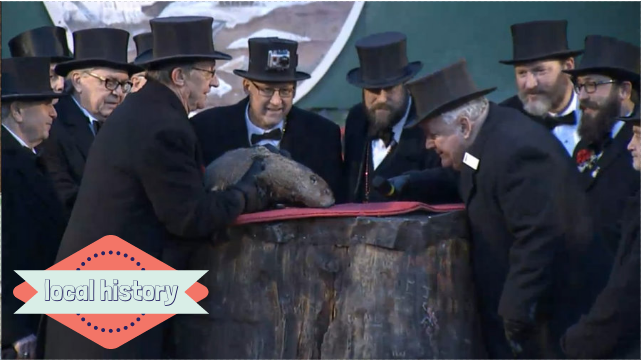 Say what you will about magic and groundhog juice and groundhogese and middle-aged men wearing full tux and tails and tophats, walking around Amish Country, USA, but I felt something when I looked at that groundhog. It was like he…knew. He wouldn’t get lost in a school. He’d find his way out, and look damn good while doing it. He was, if not magic, at least an American hero, with an illustrious centuries-long past worth knowing. And now that you’re in on the secret, every day can be Groundhog Day!